It's true that working abroad helps you learn new skills to add to your resume - and our friends at Latitude Financial Services are going to prove it. They're sending one Australian on the work and travel trip of a lifetime. The process of updating your resumé can be intimidating. You know that you’ve accomplished a lot over the last few years working in your former or current position, but it’s difficult to put into words the skills that you’ve learned. Sure, you’ve met deadlines and hit your target goals - but doesn’t everyone? Your current and future bosses are looking for more from you, something that will help you stand out in a sea of resumés and colleagues who are jockeying for raises and promotions. You need a unique talking point, a needle-in-the-haystack opportunity that will add valuable skills and experiences to your repertoire, something that will position you as a thought leader within your industry. Working abroad could be the answer. While it’s not as simple of a feat as, say, taking an online professional development course, a work and travel program could have a major impact on your future employability. Companies and clients are looking for candidates that have experience flexing their skills outside of a traditional environment, and have proven they can be successful in many situations with a variety of different people. If you’re happy with your current position, but want to make professional moves that will help you move up in the ranks, working abroad can have a similar effect. You’ll show your boss that you are adaptable and forward-thinking, and discontent with the status quo. Not convinced? Let us hit you with three more ways that working abroad can make you more employable. As a remote worker in a new country, you’ll build the skills you need to better communicate with your global colleagues and clients. 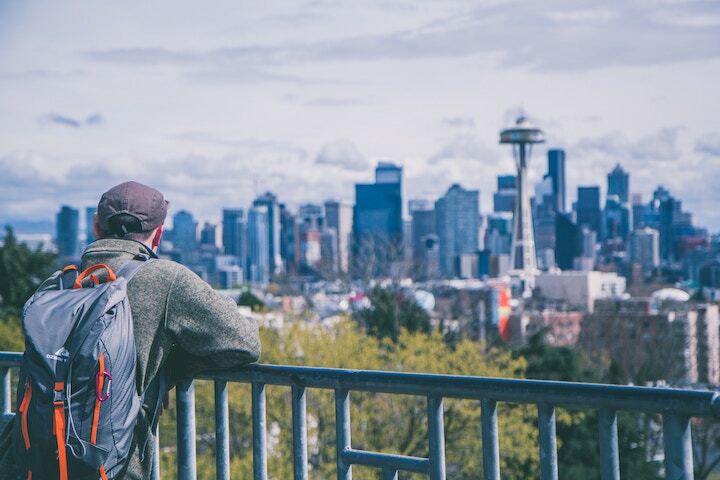 Placing yourself in a new environment forces you to become aware of local nuances and get invested in the distinct backstory that every individual city has to tell. As an employee, a freelancer, or even an entrepreneur, this skill will take you far. Throughout your career you’ll be introduced to other professionals who have the power and the potential to open new doors for you. If you’ve traveled to their home country (or even somewhere nearby), you can establish a rapport with them through common ties. Sometimes it’s the smallest of connections that can secure a professional relationship. Are you a social media-savvy Aussie? Latitude Financial Services is sending one social pro on a work and travel program. Click here to enter. Remote work brings with it an opportunity to build a new community, one that isn’t determined by borders or even cubicle walls. While you’re working around the world, you’ll be setting up shop in coworking spaces and sitting next to professionals who are employed in industries unlike yours. All these inputs from different people from different backgrounds can broaden your perspective and help you improve at your job. It’s not just the other professionals that you’ll meet on your journey that are important - you’re pretty special too. Getting out of a conventional work environment gives you the opportunity to spread your wings and build your personal brand. You can position yourself as a thought leader in your industry by participating in worldwide panels, working with global clients, or just be creating some crazy cool social media content. Your star will be on the rise once you start working abroad. Finally, choosing to work abroad will put you in a league of your own. Though this remote lifestyle is becoming more common, you’ll still be one of the first to take advantage of the location independent benefits that technology provides. To your current boss and clients, you’ll look like someone who is on the forefront of professional trends, willing to put yourself on the line in hopes of unlocking the next level of professional power. To your future network, you’ll be the person to look to for advice on what’s new and next. Remote Year has teamed up with with Latitude Financial Services to send one Australian on a 4-month work and travel program. You - yes YOU - could win a spot on an upcoming Remote Year program courtesy of Latitude Financial Services. This is your chance to do the work you love, while building the skill-set you need to live the life you’ve always dreamed of. Interested? Get involved here.